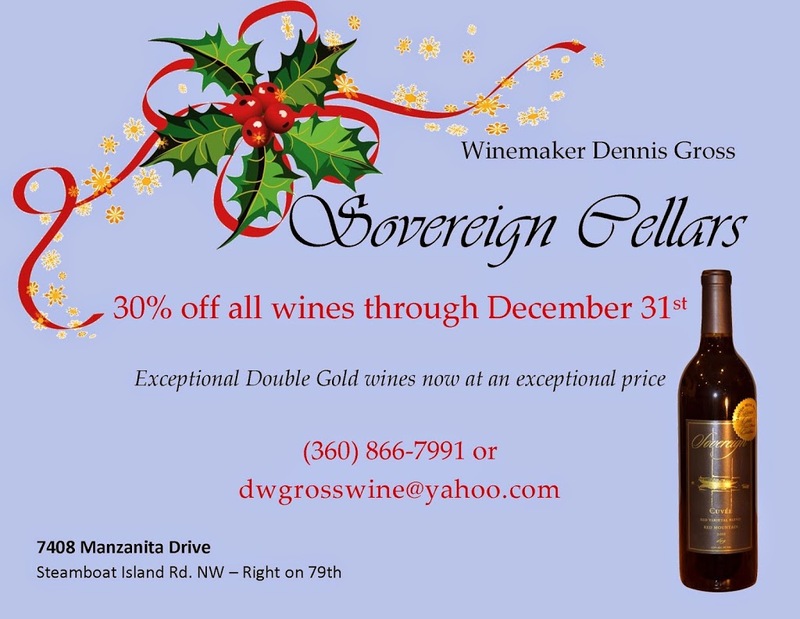 For a limited time, local winemaker Dennis Gross, of Sovereign Cellars, is offering a 30% discount on all is Double Gold winning (2014 Seattle Wine Show) reds. Many of us have tasted these wines, either at Sovereign Cellars or at local restaurants who serve them. These really are some terrific, locally produced wines. Contact Denny at (360) 866-7991 or dwgrosswine@yahoo.com for more information and to purchase before December 31st. 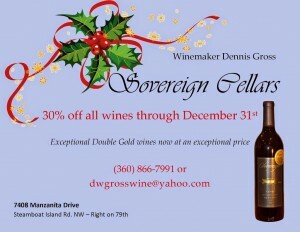 Read more about Sovereign Cellars in our article from this last June. Building Earth Farm and the folks from the old Madrona Grove Summer Fruit Truck are announcing the Return of “An Apple Affair”. After a one-year hiatus, ‘An Apple Affair’ is back! “For those of you who aren’t familiar with this event,” writes Jeannine Anderson, “‘An Apple Affair’ is a once-a-year opportunity to sample and purchase some of the finest apple varieties in Washington State.” Inspired by Feil Orchard in Wenatchee, An Apple Affair brings together varieties that have been grown for over a century by the Feil family, as well as some varieties grafted by the ever-curious Jack Feil. Feil is an octogenarian who continues to experiment with grafting unique varieties onto old orchard standards. Many of the apples featured will come from this farm, but there are several farms’ hard work represented at the Affair. Each apple variety and farm gets full credit on the table-talkers found next to each sample plate. Apples specific for baking, drying, preserving, storing and eating out of hand are featured at this local food fair. If you are someone who thinks you wouldn’t know the difference between the sweets, tarts, juicy and old-fashioneds, there is a community apple potluck table where local residents prepare their favorite varieties in traditional and new recipes. Everyone is encouraged to taste for them selves why one type is suggested over another. Bring your own favorite recipe to share, or just come and sip coffee, tea or local cider while learning about the apples. Apple inventory will be limited and you should bring a box or other container to carry some apples home with you. The Building Earth Farm will provide paper bags and pens for labeling so you don’t forget the names of your newfound favorites. 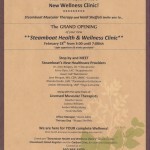 For more detailed information visit www.farmandfruitstand.com or email Jeannine at madronagrove@farmandfruitstand.com. The Building Earth Farm is also announcing it’s 2014 – 2015 Winter Box Subscription. The winter box features produce such as winter squash, carrots, onions, potatoes and the like from local farms, including ours, and Washington-grown fruit such as apples and pears. 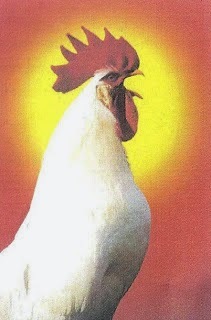 “As long as the chickens cooperate, we’ll supply our own eggs and add other wonderful items to fill in the box from the Pacific Northwest such as cheese and nuts and baked goods from The Bread Peddler (classic French baked goods) and 8 Arms Bakery (traditional and gluten-free available), both in Olympia. We will get citrus assistance from our friends in sunny California.” That’s right, this box of food is relatively local but we aren’t afraid to source lovely avocados, dates, tangelos and other tropicals to beat the rainy day blues. 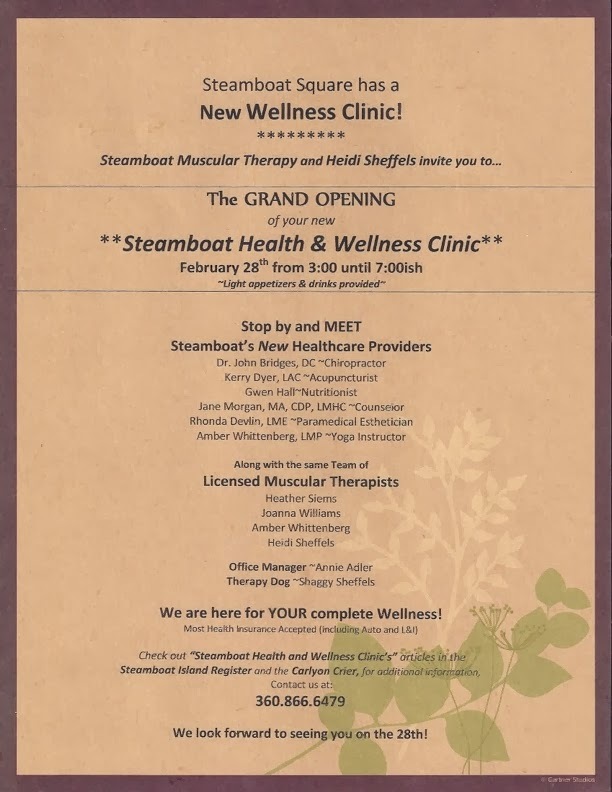 Pick Up Time and Location: 10:00 – 12:00 at the Farm, 9140 Steamboat Island Rd. NW. Pick Up Dates: November 22, 2014, December 20, 2014, January 17, 2015, February 21, 2015, March 21, 2015. How Much: $625 – Full Shares only (but you can share with friends and family). Deposit Amount: $325.00 due by October 19th. $300 Balance due by January 17, 2015. 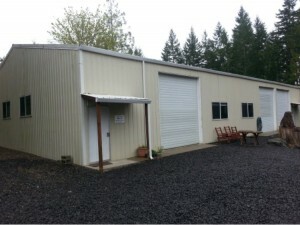 “We only have space for 16 boxes so let us know as soon as possible if you are interested.” Contact Jen at buildingearthfarm@farmandfruitstand.com. Happy Fall from the crew at Building Earth Farm! 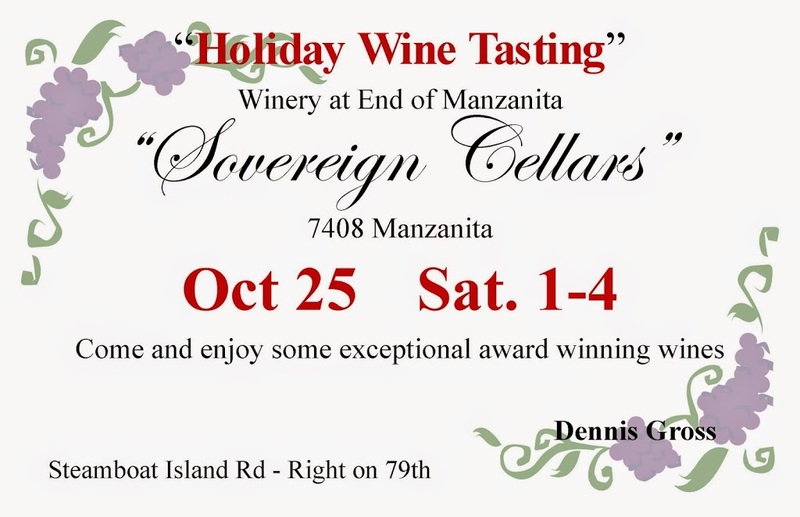 Sovereign Cellars is located at 7408 Manzanita, just off Steamboat Island Rd. NW. Click here for a map. 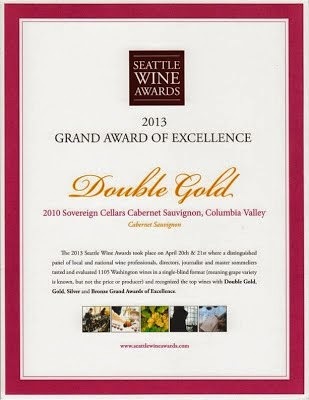 For more information about Sovereign Cellars and their Double-Gold award-winning wines, click here to see our prior post on this blog. The 2010 Cabernet Sauvignon was a winner at last year’s Seattle Wine Awards. This year, four Sovereign wines received this “Best of the Best” award. You might already know Washington ranks second in the United States in the production of wine, behind only California. There are over 80 grape varieties grown in Washington State by more than 350 grape growers. And there are more than 800 wineries producing more than 40 varietals in our state. But did you know we have an award winning winery right here, on the Steamboat Peninsula? 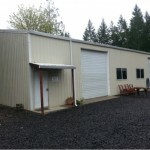 The winery is located at 7408 Manzanita Drive, off Steamboat Island Road, and is available weekdays and weekends for small private tastings, by appointment. Call 866-7991 for details. 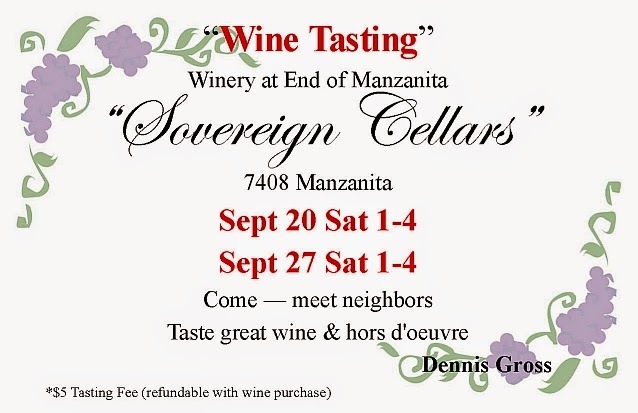 Sovereign Cellars is planning several large wine tasting events this spring and summer. 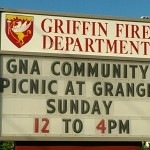 Watch this web site and the GriffinNeighbors Facebook Page as more information becomes available. Sovereign wines are sold at the Bayview Market and Haggen and are available at Budd Bay Café, Dock Street Bistro, and Water Street Café. “Come and see us anytime,” says Dennis Gross. 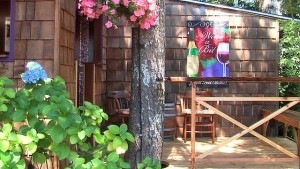 The wine tasting room is available weekdays and weekends by appointment at 866-7991. 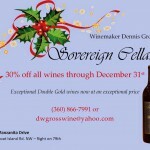 Sovereign Cellars is one of the many local businesses listed online in our Business Directory. Visit our directory whenever you are shopping for goods and services. In February 2013, Lori Hinds and Garrett Collins needed a place to train seven young boys and girls in Okinawan karate. 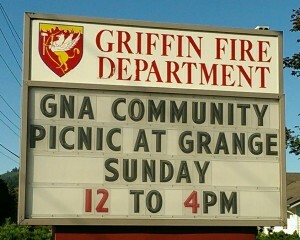 Bill Wake and the other members of Grange #314 were happy to help her make that happen. Since that first class last February, Authority Martial Arts has definitely made an impact on the Steamboat Island Peninsula and West Olympia, going from seven to 19 students in a year. Lori Hinds, 38, a police officer, has been training in karate for over eleven years. She is very passionate about what she teaches today’s youth and adults. Not only does she teach the basic mental aspects of martial arts such as discipline, respect, and humbleness, she also teaches them how to become more confident, how to set goals, and how to achieve those goals through training in karate. The ultimate goal for Sensei Lori is make all the students of Authority Martial Arts to be better members of the community. The school also hosts and attends other events too that build a sense of community including potlucks, community picnics, summer camp trips, laser tag, car washes, garage sales, holiday parties and martial art competitions. Sensei Garrett, 35, has been training in the arts for over 30 years. 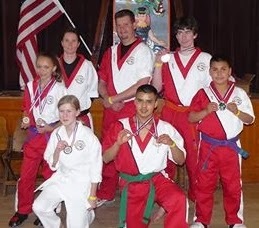 His training in the military as well as extensive experience in martial arts competition has given the school an even better balance between tradition and the competitive side of Karate. His personal goal in teaching is to help students become well-rounded competitors as well as keep them safe in situations involving self-defense. 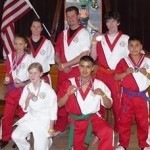 The students of Authority Martial Arts travel from Shelton, the Griffin area, and Tumwater to learn from Sensei Lori. The students, ranging from ages 7 to mid 40’s, learn punches, kicks, blocks, weapons, kata and sparring. They even travel places to compete in Martial Arts Tournaments. Although competition is not a requirement, Authority Martial Arts does have a competition team that competes throughout Washington and Northern Oregon. 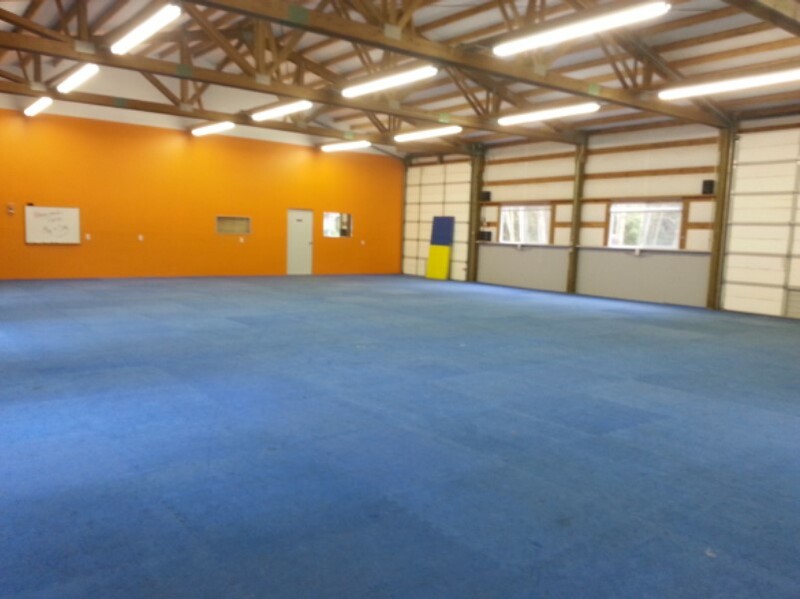 Authority Martial Arts at Prosperity Grange meets every Tuesday and Thursday from 6:00 pm-7:45 pm and costs $40.00 per month. They currently offer a trial with the first two weeks for free. 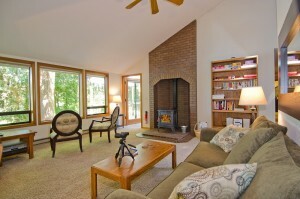 There are also special family rates available. Check out their Facebook page or email questions to sensei.57523@yahoo.com. Community Picnic, Farmers and Local Business Fair a Success! Cool and overcast weather didn’t dampen spirits as an estimated 300 or more area residents came together this last Sunday to enjoy a community picnic and farmers and local business fair. The event was hosted by Prosperity Grange, Restoration Hope Community Outreach, and the Griffin Neighborhood Association. Proceeds for the event were for the benefit of the Prosperity Grange. The grange is currently reviewing bids to upgrade their building’s electrical system. If you missed this year’s picnic, there’s a photo album growing on our Facebook page. Click here to see that album. This was the first effort on the part of the hosts to hold an event intended to meet so many simultaneous objectives. Funds were being raised for the benefit of the Prosperity Grange, organizers sought to highlight the many local businesses and farms operating in our area, and (lest we not forget) this is the community picnic held every year around this time. At the close of the day, everyone agreed the event was a terrific success. Not only was attendance higher than we’ve seen in recent years, we also saw many more families with children. Thanks to the Steamboat Island Cooperative Preschool, Cedars on the Sound, Lighthouse Alpaca Ranch, and others for giving the kids something to do, following the afternoon meal. A number of local farms and businesses made donations either directly to the Prosperity Grange or in the form of gifts for a silent auction and a golf driving game that was held during the picnic. A special thanks is made to the extraordinary contributions made by sponsors of the event. Xinh Dwelley, of Xinh’s Clam & Oyster House, prepared claims and curried mussels (seafood donated by Taylor Shellfish Farms). Steamboat Trading Post (formerly Steamboat Island Fuel, at the corner of Sexton and Old Steamboat Island Rd.) donated beverages and bags of chips. Steamboat Golf hosted a game to benefit Prosperity Grange and allowed most of the event (and the parking!) to take place on their property. Xihn’s Clam & Oyster House – free clams and curried mussels with rice! Many of these farms and businesses are listed in our online local business directory. Do you own or operate a local business, then click here for information about how you can be added to our directory. Past and present members of the Board of the Griffin Neighborhood Association staffed a pair of grills and offered hamburgers, hot dogs and veggie burgers to everyone at the picnic. Even a surprise inspection by the Thurston County Health Department didn’t slow the pace of production. At the information table for the Griffin Neighborhood Association there was on display the Little Free Library which will soon be placed near the front door of the Griffin Fire Department Headquarters. The library was donated thanks to generous contributions from local residents and the Friends of the Olympia Library. Contributions to cover the costs of the purchase and installation of the library are still being taken. Click here for more information about the Steamboat Little Free Library. There was one tragic set of circumstances associated with this year’s picnic. Bliss, of Blissful Wunders Chocolats, made a sizeable donation of his truffles. But where was all this candy, on Sunday? Rumor has it that Bliss (who was selling his chocolates elsewhere this weekend) delivered his donation to the grange hall on Thursday. These were discovered in the refrigerator by the Steamboat Bluegrass Festival, held in the grange hall on Friday night. We understand the Bluegrass Festival was quite a success and we’d like to think that was, if only in a small part, because of the chocolates meant for our community picnic. We hope to see you all at next year’s community picnic. But wait! Do not forget the Blueberry Bash, Sunday August 25th at St. Christopher’s Community Church! We’ll see you all there. And, around 3:15, the sun did come out. Did you attend the community picnic? What suggestions do you have, for next year’s picnic? Leave your comments here. 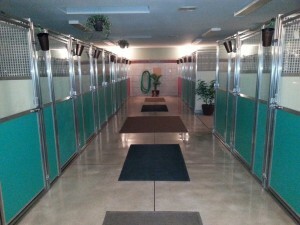 Leslie and Shane Hernstedt have for some time provided local dog boarding services at Dogwoods Canine Play and Stay. They have now added an Event Center to the facilities they offer our community. the day or by the hour. As far as dog boarding, the Hernstedt’s have recently finished a major building project and “We are extremely happy with the way it turned out.” Rates are $22.00 a night for the first pup and $18.00 a night for additional family members. The new dog boarding kennel. 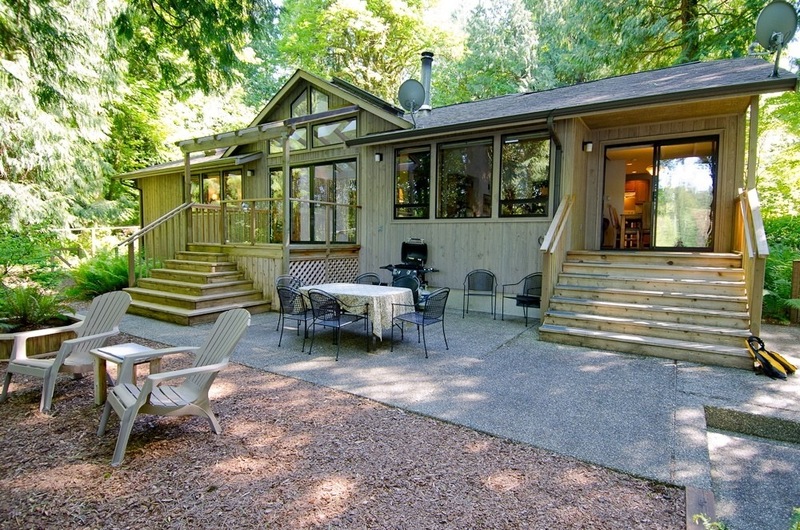 People generally choose to stay at a vacation rental home because it can be less expensive than a hotel. There is more room, people can relax together in a comfortable environment, cook their own meals (eating in restaurants can be expensive), and they can live like locals. Vicki and Amir like to stay in vacation rentals, when they travel. They like to see what ideas they can take away and find it is more fun to stay in a house than a hotel. and a flatscreen TV. There is lots to do! Vicki explains, “Before moving here, we lived in Wisconsin, Malaysia, California, and China; we moved around a lot for our jobs. At one point, we decided we wanted to find the perfect place to live: temperate climate, near the water with great natural beauty. We toured around the Northwest four different times and as soon as we came to Olympia, we knew this was home.” During their first summer here, they had 26 different visitors. 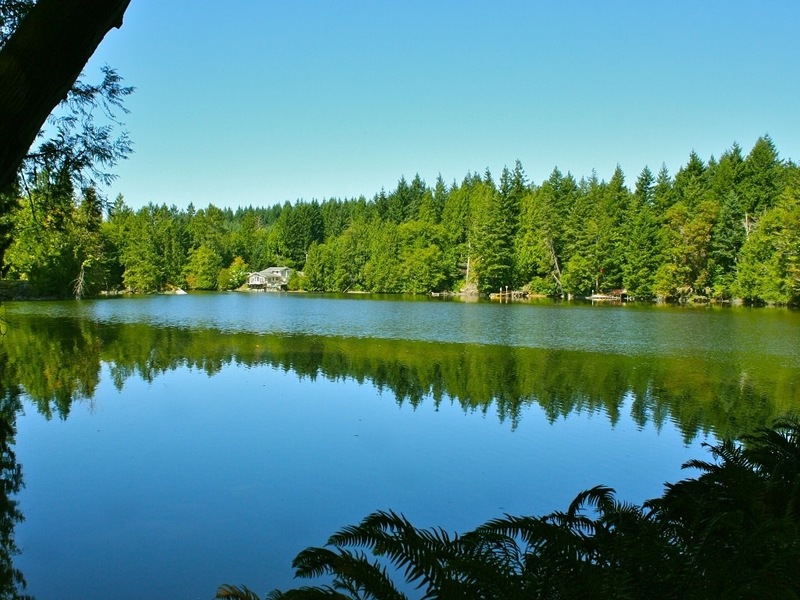 “We thought wow, people really like to visit this area; we should get a vacation rental house down the road!” When a gorgeous waterfront property on 7.7 acres came on the market, they didn’t hesitate to buy it. They made some renovations, furnished the house, and started renting it out April 2012. The high season is summer and Cedars on the Sound was almost completely booked by the end of January. In the fall and spring, they mostly get weekend visitors. As you might guess, the winter is quiet. “Winter is a great time for us to do major work on the house.” Amir is a great handyman and the two of them manage almost everything to do with the house, from reservations, guest relations, cleaning between guests, marketing, and repairs and maintenance. Gorgeous views on 7.7 acres of forest and waterfront. 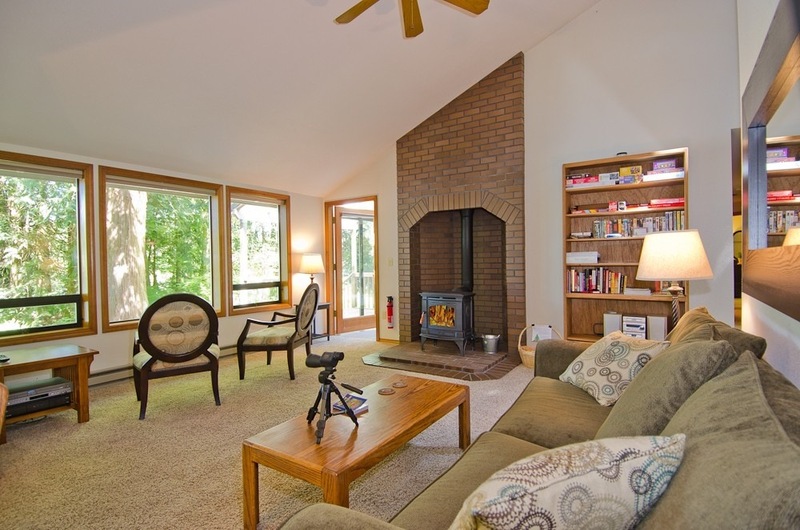 Vicki and Amir advertise on three different websites: VRBO, Homeaway and Trip Advisor (Flipkey). 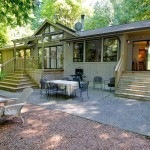 They currently have 54 reviews from our guests, making them the highest rated vacation rental house in Olympia. “We work hard to make people feel comfortable and at home during their stay. People often comment that our attention to detail and high standards of cleanliness help them relax and feel at home.” Says Vicki, “We often hear, ‘you have thought of everything! '” Guests also appreciate Vicki and Amir are locals and know the area. They have begun to assemble “Vicki’s Picks” – maps and descriptions of different parts of town with Vicki’s top picks of what to see, do, eat and experience. We welcome Cedars on the Sound to our online business directory. Do you have a local business? Click here to learn how to get your business listed. If you are looking to purchase services or materials, look to our local business directory first; you may find one of your neighbors offer exactly what you are seeking!